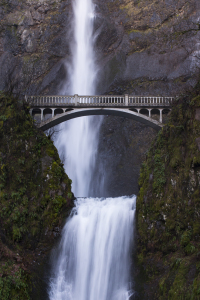 On This Day – A year ago, I posted this image of Multnomah Falls. It wasn’t long after that when the Eagle Creek fire occurred, forever changing the landscape of the mountains beyond. The fire, itself, came perilously close to the falls and the adjoining lodge. This year I will be returning for the first time. But the images will never be the same. At the beginning of winter thaw, the water rushes to the edge, the end. It’s power evident in the roar of the falls cascading over and pooling on the shelf before it cascades again to the bottom. The smell in the air is so crisp, you know spring is coming. Blossoming in the sun. beautiful. hope the place is still as it was. A wonderful shot. Looks like a must to visit place. I have not been out there since the fires. I am afraid to go look. I have plans to go out there this spring and hike to the top to get images. I will share them here once complete. it is beautiful. especially in the spring when the snow runoff increases the volume of water.